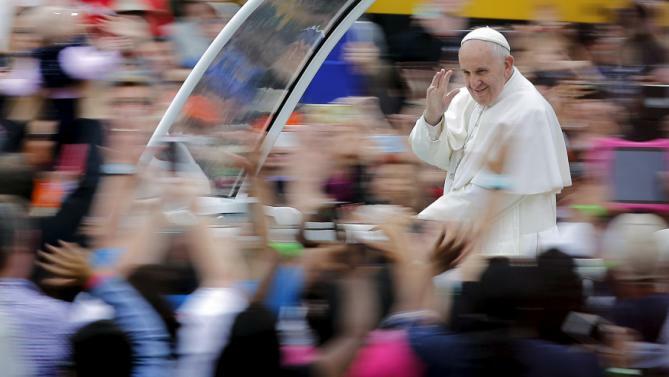 The Truth Will Make You Free: Talks of Pope Francis in the U.S. Following the public event, the Pope and President Obama will meet privately in the Oval Office, while Francis' Secretary of State, Cardinal Pietro Parolin, and other key Vatican officials will huddle with their US counterparts in the Cabinet Room. Mr President, once again I thank you for your welcome, and I look forward to these days in your country. God bless America! 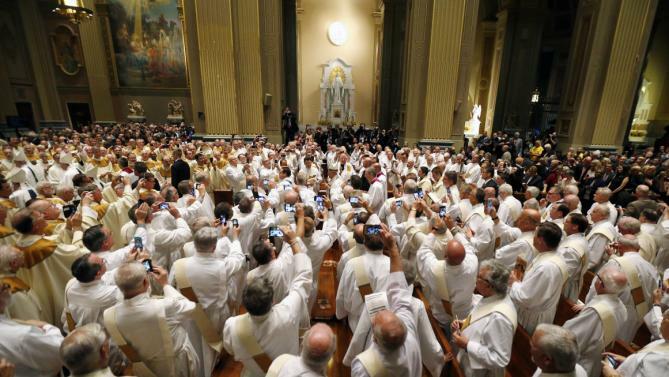 "I Have Not Come To Judge You" – The Shepherd Meets The "Flock"
Long foreseen as the key ad intramessage of this PopeTrip, at 11.30 Francis meets with the US bishops – numbering some 300, the global church's second largest national bench after Brazil's – in Washington's St Matthew's Cathedral. In the context of Midday Prayer from the Liturgy of the Hours (booklet), the speech – a homily to be given in Italian, a last-minute change from the initial plan for Spanish – will come toward the end of the rite, following the short Scripture reading. 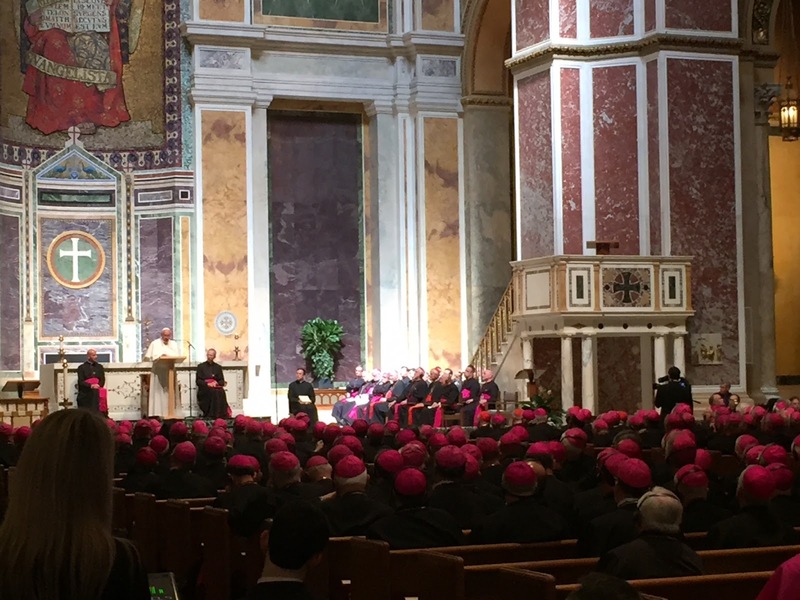 At the prayer's close, both the host-ordinary, Cardinal Donald Wuerl,and the USCCB President, Archbishop Joseph Kurtz of Louisville, will offer welcoming remarks, and only the 37 prelates of the conference's Administrative Committee will be introduced to the Pope. Whenever a hand reaches out to do good or to show the love of Christ, to dry a tear or bring comfort to the lonely, to show the way to one who is lost or to console a broken heart, to help the fallen or to teach those thirsting for truth, to forgive or to offer a new start in God... know that the Pope is at your side and supports you. He puts his hand on your own, a hand wrinkled with age, but by God’s grace still able to support and encourage. 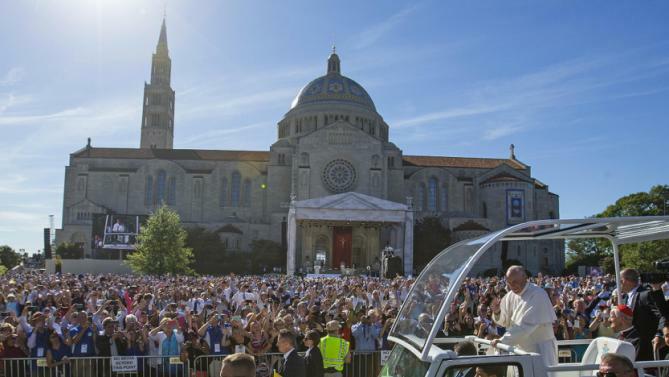 And now, the most historic moment of this Opening Day – for the first time ever, a Canonization Mass on US soil as the Pope raises BlessedJunipero Serra to sainthood. Before a crowd of 30,000 outside the Basilica of the National Shrine of the Immaculate Conception on the campus of the Catholic University of America in Washington, the rite – the lone Eucharist to be concelebrated with the bulk of the Stateside bishops – is the first of three large liturgies scheduled for this visit, the others to be Friday evening's Mass at Madison Square Garden in New York and Sunday afternoon's closing of the World Meeting of Families on Philadelphia's Benjamin Franklin Parkway, its projected running as high as a million. The 18th century missionary who played the lead role in the establishment of the Franciscan missions of California, Serra's canonization without the usually required second miracle was Francis' personal initiative in tribute to Saint Junipero's effectiveness in and dedication to evangelization as sketched out by Papa Bergoglio inEvangelii gaudium, the late 2013 text that is the governing manifesto of his pontificate. We don’t want apathy to guide our lives... or do we? We don’t want the force of habit to rule our life... or do we? So we ought to ask ourselves: What can we do to keep our heart from growing numb, becoming anesthetized? How do we make the joy of the Gospel increase and take deeper root in our lives? of two thousand years ago. Jesus did not provide a short list of who is, or is not, worthy of receiving his message, his presence. Instead, he always embraced life as he saw it. In faces of pain, hunger, sickness and sin. In faces of wounds, of thirst, of weariness, doubt and pity. Far from expecting a pretty life, smartly-dressed and neatly groomed, he embraced life as he found it. It made no difference whether it was dirty, unkempt, broken. Jesus said: Go out and tell the good news to everyone. Go out and in my name embrace life as it is, and not as you think it should be. Go out to the highways and byways, go out to tell the good news fearlessly, without prejudice, without superiority, without condescension, to all those who have lost the joy of living. Go out to proclaim the merciful embrace of the Father. Go out to those who are burdened by pain and failure, who feel that their lives are empty, and proclaim the folly of a loving Father who wants to anoint them with the oil of hope, the oil of salvation. Go out to proclaim the good news that error, deceitful illusions and falsehoods do not have the last word in a person’s life. Go out with the ointment which soothes wounds and heals hearts. The reason we are here today is that many other people wanted to respond to that call. They believed that “life grows by being given away, and it weakens in isolation and comfort” (Aparecida Document, 360). We are heirs to the bold missionary spirit of so many men and women who preferred not to be “shut up within structures which give us a false sense of security... within habits which make us feel safe, while at our door people are starving” (Evangelii Gaudium, 49). We are indebted to a tradition, a chain of witnesses who have made it possible for the good news of the Gospel to be, in every generation, both “good” and “news”. For all the sprawling schedule of this Stateside PopeTrip – three speeches, six days, 16 major talks and even more engagements – in the popular imagination, one event has loomed above them all... and this Thursday morning, here it comes. The last major text of this visit to be given in English – all the rest is slated to be in Spanish – Francis' trek to Capital Hill follows a fairly recent openness to addressing legislatures by his two predecessors; John Paul II appeared before the parliament of his native Poland in 1999, while Benedict XVI gave two of his most significant secular speeches to the British Parliament in London five years ago this week and to the German Bundestag on his last trip home in 2011. 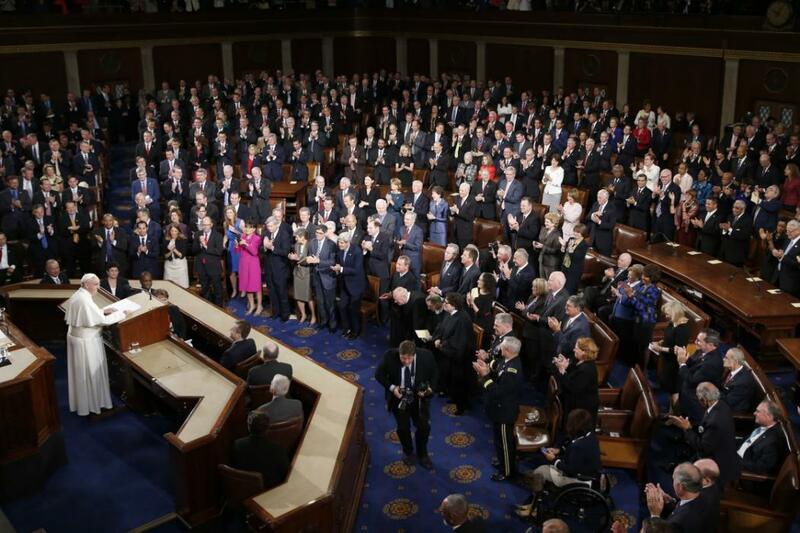 On the host side, meanwhile, the papal "yes" to the House rostrum fulfills a years-long desire of Speaker John Boehner to secure the moment, a project the Ohio Republican – himself a Catholic – has been pursuing since John Paul's pontificate. 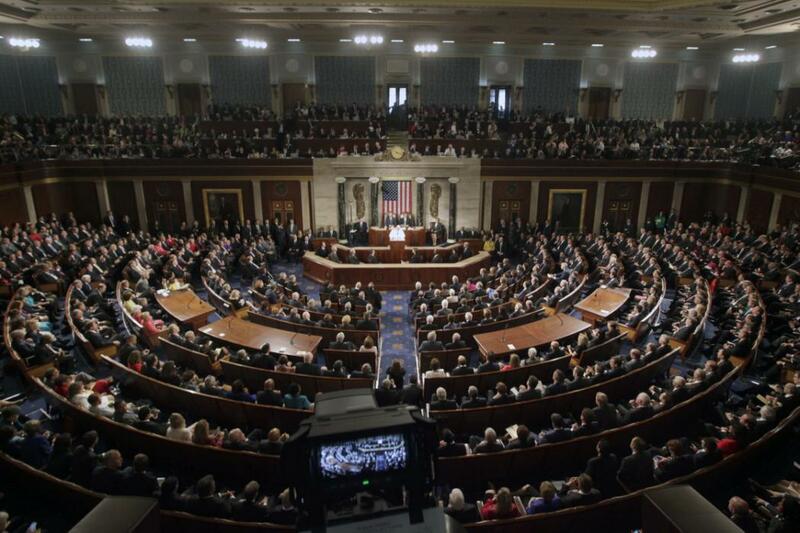 Adding to what was already a dramatic and memorable scene, Boehner's office has arranged for the speech to be shown on jumbotrons for a crowd of as many as 50,000 on the Capitol's West Front, which Francis will see as he appears on a balcony following the address to wave. Suffice it to say, expectations were higher for this talk than any other address of this visit... and in contrast to the usual hype cycle of our time, even those were exceeded. In Laudato Si’, I call for a courageous and responsible effort to “redirect our steps” (ibid., 61), and to avert the most serious effects of the environmental deterioration caused by human activity. I am convinced that we can make a difference and I have no doubt that the United States – and this Congress – have an important role to play. Now is the time for courageous actions and strategies, aimed at implementing a “culture of care” (ibid., 231) and “an integrated approach to combating poverty, restoring dignity to the excluded, and at the same time protecting nature” (ibid., 139). “We have the freedom needed to limit and direct technology” (ibid., 112); “to devise intelligent ways of... developing and limiting our power” (ibid., 78); and to put technology “at the service of another type of progress, one which is healthier, more human, more social, more integral” (ibid., 112). In this regard, I am confident that America’s outstanding academic and research institutions can make a vital contribution in the years ahead. And now, in the place the Vatican's long held to be the "Capital of the World," this Pope Trip's second leg begins. 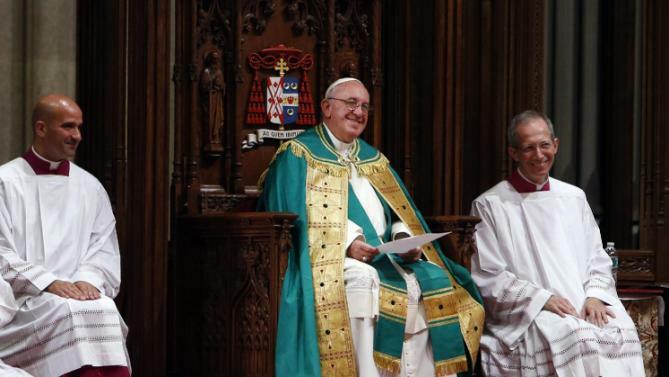 Having arrived in New York at 5pm Eastern time, Francis heads to St Patrick's Cathedral – freshly unveiled after a years-long, $175 million restoration – for Vespers at 6.45, with the clergy and religious of the 2.5 million-member archdiocese (the US second-largest) forming the bulk of the congregation. When the Vatican looks at New York as "caput mundi" – the modern "Capital of the World" – just to be clear, it's not talking about the city's prominence in media. If anything, to use a Francis-ism, that's about as self-referential as it gets. Far from the cameras and newsrooms, Gotham's prominence in Rome's eyes is drawn instead from the presence of two other key global institutions: the financial markets and the United Nations. And so it is that this PopeTrip Friday begins with Francis' turn at a hallowed tradition for the pontiffs, addressing the General Assembly, this time amid the body's observance of its 70th anniversary. In the time since, John Paul II came twice – in 1979 and 1995 – and a stop at the First Avenue headquarters was likewise a high-point of B16's 2008 swing. Now, however, a different kind of Man in White shows up: a product of the "global south" unconnected to the World War II-era polarities that birthed the UN. With Francis having forged a close relationship with Secretary-General Ban Ki-moon, however, it is a unique sign of collaboration that the UN's summit on its proposedsustainable development goals – one of the events which inspired Papa Bergoglio's preparation and timing of Laudato Si' – begins immediately after his departure today. With an unusually high contingent of some 180 heads of state and government on hand and amid reports of an "excited" atmosphere in the building that's said to be unique, Francis arrives at 8.30am, and is slated to greet the UN staff before the main speech. The United Nations is presently celebrating its seventieth anniversary. The history of this organized community of states is one of important common achievements over a period of unusually fast- paced changes. Without claiming to be exhaustive, we can mention the codification and development of international law, the establishment of international norms regarding human rights, advances in humanitarian law, the resolution of numerous conflicts, operations of peace-keeping and reconciliation, and any number of other accomplishments in every area of international activity and endeavour. All these achievements are lights which help to dispel the darkness of the disorder caused by unrestrained ambitions and collective forms of selfishness. Certainly, many grave problems remain to be resolved, yet it is clear that, without all those interventions on the international level, mankind would not have been able to survive the unchecked use of its own possibilities. Every one of these political, juridical and technical advances is a path towards attaining the ideal of human fraternity and a means for its greater realization. The ecological crisis, and the large-scale destruction of biodiversity, can threaten the very existence of the human species. The baneful consequences of an irresponsible mismanagement of the global economy, guided only by ambition for wealth and power, must serve as a summons to a forthright reflection on man: “man is not only a freedom which he creates for himself. Man does not create himself. He is spirit and will, but also nature” (BENEDICT XVI, Address to the Bundestag, 22 September 2011, cited in Laudato Si’, 6). Creation is compromised “where we ourselves have the final word... The misuse of creation begins when we no longer recognize any instance above ourselves, when we see nothing else but ourselves” (ID. Address to the Clergy of the Diocese of Bolzano-Bressanone, 6 August 2008, cited ibid.). Consequently, the defence of the environment and the fight against exclusion demand that we recognize a moral law written into human nature itself, one which includes the natural difference between man and woman (cf. Laudato Si’, 155), and absolute respect for life in all its stages and dimensions (cf. ibid., 123, 136). I began this speech recalling the visits of my predecessors. I would hope that my words will be taken above all as a continuation of the final words of the address of Pope Paul VI; although spoken almost exactly fifty years ago, they remain ever timely. “The hour has come when a pause, a moment of recollection, reflection, even of prayer, is absolutely needed so that we may think back over our common origin, our history, our common destiny. The appeal to the moral conscience of man has never been as necessary as it is today... For the danger comes neither from progress nor from science; if these are used well, they can help to solve a great number of the serious problems besetting mankind (Address to the United Nations Organization, 4 October 1965). Among other things, human genius, well applied, will surely help to meet the grave challenges of ecological deterioration and of exclusion. As Paul VI said: “The real danger comes from man, who has at his disposal ever more powerful instruments that are as well fitted to bring about ruin as they are to achieve lofty conquests” (ibid.). Pope Francis’s visit to the Ground Zero Memorial in New York and his meeting with other faith leaders there was a highly poignant moment during his U.S. visit. The Memorial Park marks the place where nearly 3,000 people lost their lives in the 9/11 terrorist attacks in 2001 when two planes flew into both of the World Trade Center’s Twin Towers, causing them to collapse shortly afterwards. It was the worst-ever single terrorist incident on U.S. soil. After praying silently for the victims, the Pope laid a white rose at the edge of one of the two massive waterfall pools where the names of those who died are inscribed. He then met the family members of some of those victims of the 9/11 attacks. Many of them were fire fighters and other rescue workers who had gone to the scene after the planes crashed into the Twin Towers and then lost their lives when the towers collapsed. Pope Francis said he hoped their presence together will be a powerful sign of their shared desire to be a force for reconciliation in this community and throughout the world. He went on to warn against attempts to create “a rigid uniformity,” saying “we can and must build unity on the basis of our diversity of languages, cultures and religions. Together, he continued, “we are called to say “no to every attempt to impose uniformity and “yes” to a diversity accepted and reconciled.” However, he pointed out that this can only happen if we uproot from our hearts all feelings of hatred, vengeance and resentment. "It is beautiful to have dreams and it is beautiful to be able to fight for them"
Here is a Vatican translation of the brief remarks Pope Francis made this afternoon as he visited a Catholic school in New York. The comments Pope Francis made off-the-cuff have been transcribed and translated by ZENIT; they are in brackets. The good thing is that we also make new friends. [The new friends we find.] We meet people who open doors for us, who are kind to us. They offer us friendship and understanding, and they try to help us not to feel like strangers, [foreigners. All the effort of people who help us to feel at home. Even though sometimes our imaginations return to our homelands, but we find good people who help us to feel at home.] How nice it is to feel that school, [the places we gather] are a second home. This is not only important for you, but also for your families. School then ends up being one big family. One where, together with our mothers and fathers, our grandparents, our teachers and friends, we learn to help one another, to share our good qualities, to give the best of ourselves, to work as a team, [to play as a team, which is so important] and to pursue our dreams. [All of you who are here, children and adults,] you have a right to dream and I am very happy that here, [whether in this school, or here,] in your friends and your teachers, [in all those who come to help] you can find the support you need. Wherever there are dreams, there is joy, Jesus is always present. [Always. On the other hand, who is the one who sows sadness, doubt, the one who sows envy, the one who sows bad desires. What's his name? The devil! The devil! The devil always sows sadness because he doesn't want us happy; he doesn't want us dreaming.] [Where there is joy, there is always Jesus] Because Jesus is joy, and he wants to help us to feel that joy every day of our lives. The Everlasting Father. No one or anything can separate us from his Love. Go out and proclaim, go out and show that God is in your midst as a merciful Father who himself goes out, morning and evening, to see if his son has returned home and, as soon as he sees him coming, runs out to embrace him. [This is good!] An embrace which wants to take up, purify and elevate the dignity of his children. A Father who, in his embrace, is “glad tidings to the poor, healing to the afflicted, liberty to captives, comfort to those who mourn” (Is 61:1-2). One hundred and sixty-nine years ago, the third bishop of Philadelphia was nakedly intentional and ambitious in dedicating his planned cathedral to Saints Peter and Paul – having settled the trusteeism wars which marked Stateside Catholicism's greatest internal crisis until recent times and shepherded his growing flock through the burning of the city's churches, the Romanesque temple on the city's western frontier would be the embodiment of a new structure, literally a fortress church, with an authority able to withstand assault from within or without. The first American bishop to be trained in Rome, Francis Kenrick's project of an institution-centric church built as womb-to-tomb service center would become the most sprawling collection of Catholic education and social work in the global church, an empire which endured for nearly two centuries and produced two saints... only to collapse under the weight of the clericalism which underpinned the enterprise and a laity anesthetized as a result, a "perfect storm" culminated in a decade of abuse scandals and widespread parish and school consolidations. In a nutshell, getting this place back on its feet – and even more, renewing the house for a different time – is the reason the Eighth World Meeting of Families, and by extension this papal visit, have come to the place Rome's long seen as its staunchest US bastion... and now, ten bishops since its builder, for the first time the chair of St John Neumann will be occupied by a Pope for the celebration of Mass. The liturgy to use the votive text of Mary, Mother of the Church. This morning I learned something about the history of this beautiful Cathedral: the story behind its high walls and windows. I would like to think, though, that the history of the Church in this city and state is really a story not about building walls, but about breaking them down. It is a story about generation after generation of committed Catholics going out to the peripheries, and building communities of worship, education, charity and service to the larger society. That story is seen in the many shrines which dot this city, and the many parish churches whose towers and steeples speak of God’s presence in the midst of our communities. It is seen in the efforts of all those dedicated priests, religious and laity who for over two centuries have ministered to the spiritual needs of the poor, the immigrant, the sick and those in prison. And it is seen in the hundreds of schools where religious brothers and sisters trained children to read and write, to love God and neighbor, and to contribute as good citizens to the life of American society. All of this is a great legacy which you have received, and which you have been called to enrich and pass on. Most of you know the story of Saint Katharine Drexel, one of the great saints raised up by this local Church. When she spoke to Pope Leo XIII of the needs of the missions, the Pope – he was a very wise Pope! – asked her pointedly: “What about you? What are you going to do?”. Those words changed Katharine’s life, because they reminded her that, in the end, every Christian man and woman, by virtue of baptism, has received a mission. Each one of us has to respond, as best we can, to the Lord’s call to build up his Body, the Church. “What about you?” I would like to dwell on two aspects of these words in the context of our particular mission to transmit the joy of the Gospel and to build up the Church, whether as priests, deacons, or members of institutes of consecrated life. First, those words – “What about you?” – were addressed to a young person, a young woman with high ideals, and they changed her life. They made her think of the immense work that had to be done, and to realize that she was being called to do her part. How many young people in our parishes and schools have the same high ideals, generosity of spirit, and love for Christ and the Church! Do we challenge them? Do we make space for them and help them to do their part? To find ways of sharing their enthusiasm and gifts with our communities, above all in works of mercy and concern for others? Do we share our own joy and enthusiasm in serving the Lord? One of the great challenges facing the Church in this generation is to foster in all the faithful a sense of personal responsibility for the Church’s mission, and to enable them to fulfill that responsibility as missionary disciples, as a leaven of the Gospel in our world. This will require creativity in adapting to changed situations, carrying forward the legacy of the past not primarily by maintaining our structures and institutions, which have served us well, but above all by being open to the possibilities which the Spirit opens up to us and communicating the joy of the Gospel, daily and in every season of our life. “What about you?” It is significant that those words of the elderly Pope were also addressed to a lay woman. We know that the future of the Church in a rapidly changing society will call, and even now calls, for a much more active engagement on the part of the laity. The Church in the United States has always devoted immense effort to the work of catechesis and education. Our challenge today is to build on those solid foundations and to foster a sense of collaboration and shared responsibility in planning for the future of our parishes and institutions. This does not mean relinquishing the spiritual authority with which we have been entrusted; rather, it means discerning and employing wisely the manifold gifts which the Spirit pours out upon the Church. In a particular way, it means valuing the immense contribution which women, lay and religious, have made and continue to make, to the life of our communities. Dear brothers and sisters, I thank you for the way in which each of you has answered Jesus’ question which inspired your own vocation: “What about you?”. I encourage you to be renewed in the joy of that first encounter with Jesus and to draw from that joy renewed fidelity and strength. I look forward to being with you in these days and I ask you to bring my affectionate greetings to those who could not be with us, especially the many elderly priests and religious who join us in spirit. During these days of the World Meeting of Families, I would ask you in a particular way to reflect on our ministry to families, to couples preparing for marriage, and to our young people. I know how much is being done in your local Churches to respond to the needs of families and to support them in their journey of faith. I ask you to pray fervently for them, and for the deliberations of the forthcoming Synod on the Family. Now, with gratitude for all we have received, and with confident assurance in all our needs, let us turn to Mary, our Blessed Mother. With a mother’s love, may she intercede for the growth of the Church in America in prophetic witness to the power of her Son’s Cross to bring joy, hope and strength into our world. I pray for each of you, and I ask you, please, to pray for me. "Religious liberty, by its nature, transcends places of worship and the private sphere of individuals and families"
Here is a Vatican translation of the address Pope Francis gave this afternoon in Philadelphia, at a meeting with immigrants on the theme of religious freedom. ZENIT's transcription and translation of his few off-the-cuff remarks are found in brackets. One of the highlights of my visit is to stand here, before Independence Mall, the birthplace of the United States of America. It was here that the freedoms which define this country were first proclaimed. The Declaration of Independence stated that all men and women are created equal, that they are endowed by their Creator with certain inalienable rights, and that governments exist to protect and defend those rights. Those ringing words continue to inspire us today, even as they have inspired peoples throughout the world to fight for the freedom to live in accordance with their dignity. All of us benefit from remembering our past. A people which remembers does not repeat past errors; instead, it looks with confidence to the challenges of the present and the future. Remembrance saves a people’s soul from whatever or whoever would attempt to dominate it or use it for their interests. When individuals and communities are guaranteed the effective exercise of their rights, they are not only free to realize their potential, they also contribute -- [with these capacities, with their work] -- to the welfare and enrichment of society. Our various religious traditions serve society primarily by the message they proclaim. They call individuals and communities to worship God, the source of all life, liberty and happiness. They remind us of the transcendent dimension of human existence and our irreducible freedom in the face of every claim to [any] absolute power. We need but look at history, [it serves us well to look at history,] especially the history of the last century, to see the atrocities perpetrated by systems which claimed to build one or another “earthly paradise” by dominating peoples, subjecting them to apparently indisputable principles and denying them any kind of rights. Our rich religious traditions seek to offer meaning and direction, “they have an enduring power to open new horizons, to stimulate thought, to expand the mind and heart” (Evangelii Gaudium, 256). They call to conversion, reconciliation, concern for the future of society, self-sacrifice in the service of the common good, and compassion for those in need. At the heart of their spiritual mission is the proclamation of the truth and dignity of the human person and human rights. Our religious traditions remind us that, as human beings, we are called to acknowledge an Other, who reveals our relational identity in the face of every effort to impose “a uniformity to which the egotism of the powerful, the conformism of the weak, or the ideology of the utopian would seek to impose on us” (M. de Certeau). In a world where various forms of modern tyranny seek to suppress religious freedom, or try to reduce it to a subculture without right to a voice in the public square, or to use religion as a pretext for hatred and brutality, it is imperative that the followers of the various religions join their voices in calling for peace, tolerance and respect for the dignity and rights of others. We live in a world subject to the “globalization of the technocratic paradigm” (Laudato Si’, 106), which consciously aims at a one-dimensional uniformity and seeks to eliminate all differences and traditions in a superficial quest for unity. The religions thus have the right and the duty to make clear that it is possible to build a society where “a healthy pluralism which respects differences and values them as such” (Evangelii Gaudium, 255) is a “precious ally in the commitment to defending human dignity… and a path to peace in our troubled world” (ibid., 257) [so troubled by war]. The Quakers who founded Philadelphia were inspired by a profound evangelical sense of the dignity of each individual and the ideal of a community united by brotherly love. This conviction led them to found a colony which would be a haven of religious freedom and tolerance. That sense of fraternal concern for the dignity of all, especially the weak and the vulnerable, became an essential part of the North American spirit. During his visit to the United States in 1987, Saint John Paul II paid moving homage to this, reminding all Americans that: “The ultimate test of your greatness is the way you treat every human being, but especially the weakest and most defenseless ones” (Farewell Address, 19 September 1987, 3). I take this opportunity to thank all those, of whatever religion, who have sought to serve the God of peace by building cities of brotherly love, by caring for our neighbors in need, by defending the dignity of God’s gift of life in all its stages, by defending the cause of the poor and the immigrant. All too often, [and everywhere], those most in need of our help are unable to be heard. You are their voice, and many of you, [men and women religious], have faithfully made their cry heard. In this witness, which frequently encounters powerful resistance, you remind North American democracy of the ideals for which it was founded, and that society is weakened whenever and wherever [any] injustice prevails. "All of the love that God has in Himself, all of the beauty that God has in Himself, all of the truth that God has in Himself, He gives to the family"
Here is a ZENIT transcription and translation of the address Pope Francis gave this evening at the Festival of Families at the World Meeting of Families. He chose not to follow his prepared text and instead gave the following address off-the-cuff. Thank you to those who have given their testimonies. Thank you to those who have brought us joy with their art, with beauty, which is the path to reach God. Beauty brings us to God. And a true testimony brings us to God, because God also is the truth, He is beauty, He is goodness, and a testimony given to serve is good, it makes us good people, because God is good. It brings us to God. All that is good, all that is true, all that is beautiful brings us to God. Because God is good, God is beautiful, God is the truth. Thank you to everyone who gave us a message here and [thank you] for the presence of all of you, which is also a testimony, a true testimony that it is worthwhile to live as a family, that a society grows strong, grows in goodness, grows in beauty and truly grows if it is built on the foundation of the family. Once, a boy asked me — you know that children ask hard questions — he asked me, "Father, what did God do before He created the world?" I can tell you that it was hard for me to come up with an answer. I told him what I’m saying now to you. Before creating the world, God loved, because God is love. But there was so much love that He had within Himself, this love between the Father and the Son and the Holy Spirit, it was so great, so overflowing that — I don’t know if this is very theological, but you’ll understand what I mean — it was so great that He couldn't be egotistical. He had to come out of Himself so as to have that which He could love outside of Himself. And there God created the world. There God made this marvel in which we live and, since we’re a little mixed up, we are destroying it. But the most beautiful thing that God made, the Bible says, was the family. He created man and woman, and He gave them everything. He gave them the world! Grow, multiply, cultivate the earth, make it produce, make it grow. He presented to a family all of the love that He made in this marvelous creation. Let’s go back a bit. All of the love that God has in Himself, all of the beauty that God has in Himself, all of the truth that God has in Himself, He gives to the family. And a family is truly a family when it is able to open its arms and receive all of this love. Obviously, earthly paradise is here no longer. Life has its problems. Men, because of the devil’s astuteness, learned to have divisions among themselves. And all of this love that God had given was nearly lost. And shortly thereafter, the first crime, the first fratricide. A brother kills another brother: war. The love, the beauty, and the truth of God — and the destruction of war. And between these two poles, we walk today. We have to decide. We have to decide on which path to walk. And he was able to do this because this family was a family that had its heart open to love, that had the doors open to love. Let’s think of Mary, this young woman. She couldn’t believe it. "How can this be?" And when it was explained to her, she obeyed. Let’s think of Joseph, full of dreams to form a household. He finds himself with this surprise that he doesn’t understand. He accepts. He obeys. And in the obedience of love of this woman, Mary, and of this man, Joseph, a family is created into which comes God. We are in the Festival of Families. The family has a divine passport, is that clear? The passport that a family has is issued it by God, so that within its heart, truth, love, and beauty would grow more and more. Sure, one of you could say to me, "Father, you speak this way because you’re single." In families, there are difficulties. In families, we argue; in families, sometimes the plates fly; in families, the children give us headaches. And I’m not even going to mention the mother-in-law. But in families, there is always, always, the cross. Always. Because the love of God, of the Son of God, also opened for us this path. But, in families as well, after the cross, there is the resurrection. Because the Son of God opened for us this path. Because of this, the family is — forgive the term I’ll use — it is a factory of hope, of hope of life and of resurrection. God was the one who opened this path. And the children. The children make us work. We, too, as sons and daughters also created work. Sometimes, at home, I see some of my collaborators who come into work with dark circles under their eyes. They have a baby who is a month old, or two moths old, and I ask them, "You didn’t sleep?" "Oh no, he cried all night long." In families, there are difficulties, but these difficulties are overcome with love. Hate doesn’t overcome any difficulty. Division of hearts doesn’t overcome any difficulty. Only love is capable of overcoming difficulties. Love is a festival. Love is joy. Love is to keep moving forward. To take care of the grandparents and to take care of the children is the sign of love — I don’t know if it’s the greatest but I would say the most promising [sign of love] of the family, because it promises the future. A people that does not know how to care for the children and a people that does not know how to care for the grandparents is a people without a future, because it doesn’t have strength and it doesn’t have the memory that will carry it forward. May God bless you. May God give you strength. May God strengthen you to keep moving forward. Let us care for the family. Let us defend the family, because there, there, our future is in play. Thank you, may God bless you and pray for me, please. Thank you for receiving me and givingme the opportunity to be here with you and to share this time in yourlives. It is a difficult time, one full of struggles. I know it is apainful time not only for you, but also for your families and for allof society. Any society, any family, which cannot share or takeseriously the pain of its children, and views that pain as somethingnormal or to be expected, is a society "condemned” to remain ahostage to itself, prey to the very things which cause that pain. I am here as a pastor, but above all asa brother, to share your situation and to make it my own. I have comeso that we can pray together and offer our God everything that causesus pain, but also everything that gives us hope, so that we canreceive from him the power of the resurrection. I think of the Gospel scene where Jesuswashes the feet of his disciples at the Last Supper. This wassomething his disciples found hard to accept. Even Peter refused, andtold him: "You will never wash my feet” (Jn 13:8). In those days, it was the custom towash someone’s feet when they came to your home. That was how theywelcomed people. The roads were not paved, they were covered withdust, and little stones would get stuck in your sandals. Everyonewalked those roads, which left their feet dusty, bruised or cut fromthose stones. That is why we see Jesus washing feet, our feet, thefeet of his disciples, then and now. Life is a journey, along differentroads, different paths, which leave their mark on us. We know in faith that Jesus seeks usout. He wants to heal our wounds, to soothe our feet which hurt fromtravelling alone, to wash each of us clean of the dust from ourjourney. He doesn’t ask us where we have been, he doesn’tquestion us what about we have done. Rather, he tells us: "Unless Iwash your feet, you have no share with me” (Jn 13:8). Unless I washyour feet, I will not be able to give you the life which the Fatheralways dreamed of, the life for which he created you. Jesus comes tomeet us, so that he can restore our dignity as children of God. Hewants to help us to set out again, to resume our journey, to recoverour hope, to restore our faith and trust. He wants us to keep walkingalong the paths of life, to realize that we have a mission, and thatconfinement is not the same thing as exclusion. Life means "getting our feet dirty”from the dust-filled roads of life and history. All of us need to becleansed, to be washed. All of us are being sought out by theTeacher, who wants to help us resume our journey. The Lord goes insearch of us; to all of us he stretches out a helping hand. It is painful when we see prisonsystems which are not concerned to care for wounds, to soothe pain, to offer new possibilities. It is painful when we see people whothink that only others need to be cleansed, purified, and do notrecognize that their weariness, pain and wounds are also theweariness, pain and wounds of society. The Lord tells us this clearlywith a sign: he washes our feet so we can come back to the table. Thetable from which he wishes no one to be excluded. The table which isspread for all and to which all of us are invited. This time in your life can only haveone purpose: to give you a hand in getting back on the right road, togive you a hand to help you rejoin society. All of us are part ofthat effort, all of us are invited to encourage, help and enable yourrehabilitation. A rehabilitation which everyone seeks and desires: inmates and their families, correctional authorities, social andeducational programs. A rehabilitation which benefits and elevatesthe morale of the entire community. Jesus invites us to share in his lot, his way of living and acting. He teaches us to see the world throughhis eyes. Eyes which are not scandalized by the dust picked up alongthe way, but want to cleanse, heal and restore. He asks us to createnew opportunities: for inmates, for their families, for correctionalauthorities, and for society as a whole. I encourage you to have this attitudewith one another and with all those who in any way are part of thisinstitution. May you make possible new opportunities, new journey, new paths. All of us have something we need to becleansed of, or purified from. May the knowledge of that fact inspireus to live in solidarity, to support one another and seek the bestfor others. Let us look to Jesus, who washes ourfeet. He is "the way, and the truth, and the life”. He comes tosave us from the lie that says no one can change. He helps us tojourney along the paths of life and fulfillment. May the power of hislove and his resurrection always be a path leading you to new life. Together with last night's address by Francis at a star-studded Festival of Families on the city's grand ceremonial boulevard – for which the Pope tossed aside his prepared text to give a sprawling, emotional half-hour reflection – the message Francis delivers at today's liturgy will likely serve to point squarely toward next Sunday in Rome, when the Vatican's main event of 2015, the climactic second part of the Synod of Bishops for the Family, opens with a sizable mandate to discuss possible changes to the church's pastoral care for families in challenging situations vis á vis church teaching. In a powerful preach – echoing an equally strong Julymessage on the family in Latin America – Francis again urged the coming Synod to take up the challenge of not "being so narrow" and aim instead at "being open to miracles of love for the sake of all"... all without explicitly mentioning the coming assembly in Rome.